BadgerCare is Wisconsin’s healthcare plan for low-income residents—and as state healthcare programs go, it’s one of the best. Wisconsin now ranks second in the country in percentage of people with access to health care. Massachusetts, with its mandatory health insurance program, is first. Are not getting BadgerCare Plus, Medicaid or Medicare. Once an applicant is accepted to BadgerCare Plus Core Plan, the healthcare is free with the exception of $3 co-pays for doctor visits and some prescriptions, and $100 for a hospital stay. The covered benefits are remarkably comprehensive. As of June 15, 2009, the Wisconsin Department of Health Services began accepting applications for the BadgerCare Plus Core Plan with the earliest enrollment date July 15, 2009. Unfortunately, by October 2009, the application process for the plan was suspended because the total number of applications was greater than the 60,000 slots available. A Core Plan wait list was created, and people on the wait list will be able to enroll in the Core Plan as space becomes available. But a wait list was not good enough for Wisconsin Governor Jim Doyle. On June 1, 2010, he announced that individuals who are currently waiting for health care coverage under the BadgerCare Plus Core Plan now have the option to enroll in the BadgerCare Plus Basic plan. The Basic plan is an entirely self-funded health care plan created for more than 50,000 adults without dependent children who are on the BadgerCare Plus Core Plan waiting list. 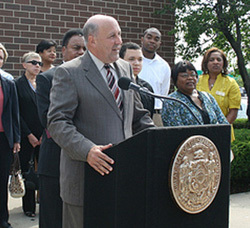 Benefits will start for some enrollees July 1, 2010. Premiums will be $130 per month. •Badger Rx Gold discount drug membership. The Basic plan is not designed to be a long-term health coverage plan, but is instead a temporary plan to help people take care of their health care needs while they wait for coverage on the BadgerCare Plus Core Plan. BadgerCare Plus Basic builds on Governor Doyle’s work over the last seven years to make Wisconsin a health care leader.